Soft, chewy, sweet, and buttery, caramels are a classic candy with a distinctive taste and texture. These 10 caramel candies are the most popular and best-reviewed caramel recipes on my site. If you're a caramel fan, you're sure to find one that you love. This is my #1 rated caramel recipe! These five-star soft caramels have a creamy, chewy texture that melts in your mouth and never sticks to your teeth. They are delicious on their own, dipped in chocolate, or used in other baked goods. The combination of smooth, sweet caramel, crunchy salt crystals, and bittersweet chocolate may sound unusual, but it makes these sea salt caramel candies impossible to put down. A sweet, chewy caramel is packed with salty, crunchy peanuts. These peanut caramels are great on their own, but when they are dipped in chocolate they are positively decadent and resemble miniature candy bars. Coffee caramels have a smooth, smoky coffee taste and a rich, chewy, buttery texture. These are wonderful by themselves, or with a milk chocolate coating. These dulce de leche pecan bites is one of our absolute favorites! Dulce de leche is sandwiched between two large toasted pecans, and then the whole package is dipped in chocolate. The combination of sweet and tangy dulce de leche, crunchy toasted pecans, and rich chocolate is fabulously addicting. These classic turtle candies earn 5 stars from reviewers. Toasted pecans are smothered with caramel and chocolate to produce whimsical turtle shapes. Autumn caramels taste like fall with flavors of cinnamon, cloves, nutmeg, and allspice are all infused into the cream that goes into the caramels. 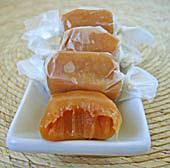 he resulting caramels have a wonderfully aromatic flavor and a smooth, rich texture that's not too stiff and not too soft. One reviewer says, "This was really easy to make and tasted amazing." If you try these, you'll find that the rich chocolate caramel, studded with toasted pecans, will win you over too. A thick spiral of chewy caramel is wrapped around a crunchy, salty pretzel. The whole thing is dipped in sweet milk chocolate and finished with nutty chopped peanut butter chips. If you’re a fan of the sweet-and-salty flavor combination, you’ll love these caramel-wrapped pretzel rods!